The "Hell's Rebels" Mega SoundPack gives you the complete audio solution when playing the popular "Hell's Rebels" Adventure Path. All the preparation is done for you, and every sound you'll need is right at your fingertips. * and... an epic final battle in the depths of hell! Do you hear a heartbeat? "I toil only for gifts"
"A man with the gleam of hell"
This SoundSet was imagined, compiled, designed, created, mixed and finished by Benjamin Loomes of www.syrinscape.com, using samples created by him and also by the wonderful Morgan Jenkins of the goinginblindpodcast.com and the inestimable Morgan Rands. Pathfinder Adventure Path: Hell's Rebels, Turn of the Torrent © 2015. 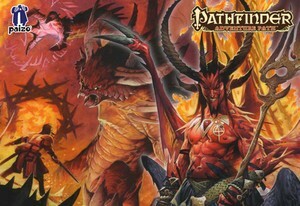 Paizo Inc., the Paizo golem logo, Pathfinder, and Pathfinder Adventure Path are trademarks of Paizo Inc. Author: James Jacobs. SoundSet © 2015. Sounds created under license with Paizo Inc.
Pathfinder Adventure Path: Hell's Rebels, Breaking the bones of Hell © 2016. Paizo Inc., the Paizo golem logo, Pathfinder, and Pathfinder Adventure Path are trademarks of Paizo Inc. Author: James Jacobs. SoundSet © 2015. Sounds created under license with Paizo Inc.